In reality it sounded pretty mediocre IMO. But....but....no, that couldn't be true.....that would mean the magazines all LIED! I heard that very set up at Munich and it really wasn't up to much. 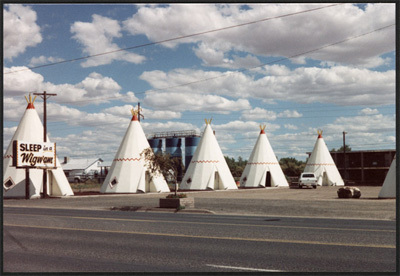 I've stayed there, the wigwam motel on Route 66. Arnie Nudell's original Infinity IRS system. Must have been something back in the day.... probably made Isobariks weep. First picture is his own room. KK got to hear the system, Nudell only used master tapes. Only the speakers spoil the show. B&W CM2s, originally bought for bookshelves in our previous gaff. Now need stands but Mrs TLM won't allow. Get some Linn Kans on that Matt and you will be in musical heaven, although l suspect you are there already. Lets just put this thread right, time warp system. Voyd the Voyd, Helius Cyalene, Milltek Olympia, Audio Innovations 1000 pre, 2nd audio mono blocks and Impulse H6 or Snell Jii or E.
Pretty much what I had 20 years ago when my ears worked and I had time to play in the years BC (Before Children) not AD (After daughters)!! The way things are going you'll need to find a wormhole to another dimension to find a Wigwam show in 2017. Love these photo's! Does this mean your going to be wearing a suit at the next Wigwam show Nial? That Naim system still looks amazing, their equipment is ageless! I'd swap those speakers out though get a nice set of modern (but still tradition looking) Harbeths on it if it was mine. bit too many boxes for me personally though and the old school naim sound, but I'd still love to hear it. And that Naim system would probably stack up against modern kit easily, but it would probably cost you the same if not a lot more to buy now! Gosh, those flairs look like they hurt to Ware! lol, brilliant. Enough to put anyone off!